The fundamental purpose of all Montessori education efforts is to create a more peaceful world through nurturing the spirit of the developing young child. This objective differs from traditional teaching for it requires that children be made aware of their higher purpose over self-service or self-indulgence. This philosophy cultivates a respect and curiosity for the natural world and an understanding and acceptance of others through the virtues of love, humility, perseverance, adaptability, kindness, and compassion. “Help me to help myself” is the call of the primary child, and they develop their own sense of self and independence through direct experience with the Montessori materials and in relationship to the classroom community. The primary classroom is a dynamic learning environment of mixed ages of 3-6 year-old children and is designed for developing physical and emotional independence. The room is prepared purposefully and attractively with all furnishings and manipulatives scaled to the child’s size. This custom fit for the young child creates a welcoming and inviting space that appeals to the child’s emerging independence. Our classrooms foster an authentic desire to learn in a design where the oldest children mentor and inspire the youngest. Older children model respectful handling of and working with the materials and assist younger children as needed. Social and emotional intelligence is cultivated through this mentor influence as well as positive reinforcement, repetition with materials, and consistent attendance. The child develops more complex cognitive skills as they ascend through the curriculum in the third year. The use of the trademark Montessori materials is based on the young child’s unique aptitude for learning with ease, which Dr. Montessori described as the “absorbent mind.” The child actually absorbs social behaviors, language, and information through all of their senses from age 0-6. Young children in Montessori classrooms have shown evidence of learning to read, write, and calculate in the same natural way that they learn to walk and talk. The materials are inviting, realistic, and precise, and they provide for specific periods of interest and readiness based on developmental markers. The carefully prepared children’s environment allows the child to experience choice, develop fine and gross motor skills through manipulative materials, and hone attention to scaffold these building blocks for lifelong learning. These are beginning daily living activities for the three- and four year-old children who are developing control of movement, attention, sequencing, independence with self-care, and care of the environment. Designed for use by all ages, these didactic manipulatives isolate unique qualities such as length, breadth, height, color, sound, and shape. 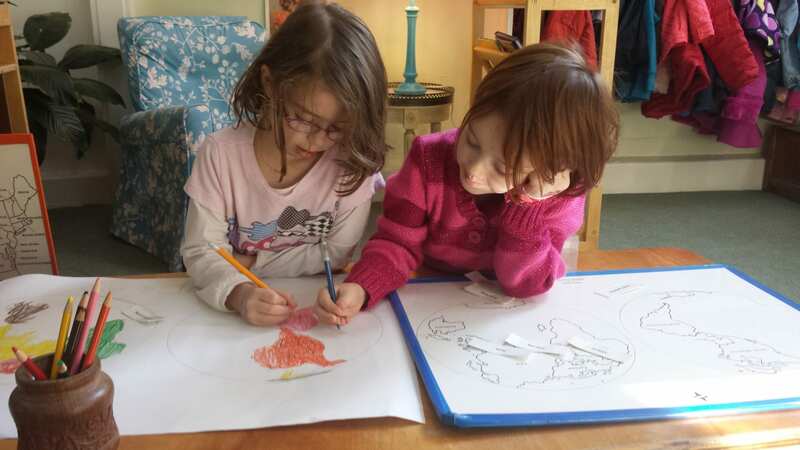 Learning through materialized abstractions, children construct, compare, and contrast to develop the ability to discriminate and categorize the world. Development is interdisciplinary relative to the child’s interaction with the Montessori classroom materials and the community. Oral language is developed through song, story, poems, and sound games. Prerequisite letter sound association and phonemic awareness is cultivated with Montessori’s signature sandpaper cursive letters. Word building is achieved with a movable alphabet to foster emergent readers. The youngest child is exposed to these tactile materials based on Montessori’s findings that confirm the child’s sensitivity to readily absorb language. Concrete materials reinforce one-to-one correspondence with numbers base 1-10. The base 10 decimal system is introduced with concrete manipulative glass beads, providing opportunities for learning arithmetic concepts with complex numbers as well as linear and skip counting to 1,000 with the colored bead chains. Exploration is based on the child’s interest and developmental tendencies. Art materials provide direct experience with color, texture, contrast, compliment, and symmetry with developmentally appropriate materials in a wide range of mediums. Music is a daily part of the primary experience through group singing, listening appreciation, and exploration of the pentatonic scale with the Montessori bells. Movement with music, song, rhythm, and rhyme are also employed daily at group time to develop the phonological listening skills critical to reading in order to recognize holidays and seasons and to create a general love of community gathering. Our planet’s geography is discussed with globes, maps, and models of geographic formations, and botany and biology are introduced through exposure to the outside world, gardening, observing, discussion, and study of plants and animals. After eating lunch together, Half-Day children, and those who are nappers, depart at 12:30 pm, and Full-Day children are divided by age into one of two programs: Rainbow Room or Montessori Extended-Day. Once a child is no longer napping, they may join one of the Full-Day programs until 2:30 pm. All Primary children are eligible to transition from the Rainbow Room Program to the Extended-Day Program when they reach 4 1/2 years-old by either mid-October or early-January, depending on their birthdate. It is our belief and experience that limiting these transitions to just two times a year simplifies the process for parents and teachers and results in greater success for the children. This program prepares the younger children for their transition to a full day in the classroom. They enjoy an afternoon of art, stories, music, movement, outside play, and other delightful activities that nurture the whole child. The older children (4 1/2 years and up) remain in their classroom for the full day. They engage in an additional Montessori work period where some of the “big work” comes out, more complex lessons are given, and community jobs are done.